County Propane has several storage locations with over 22 million gallons of LP gas storage available. Our storage tanks are filled on a daily basis to insure a constant supply of propane so that our customers’ needs are always met. We only use HD5 which is the highest grade of propane available. Rain, sleet, wind or snow, our fleet of delivery vehicles guarantee that our customers’ needs will be handled in any type of weather. 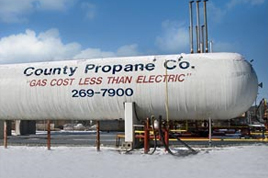 With County Propane Company you can be sure that you’ll never be left in the cold.